Studies in Indonesia this week have warned that more than a quarter of Jakarta’s 661.5 square kilometres will be submerged by water in less than a decade. As one of the world’s most populous urban centres continues to grow at an exponential rate, there is evidence to suggest that the city of 10.6 million will continue to sink rapidly if no urgent measures are taken to ensure its survival. According to a study by the geodesy research division of the Bandung Institute of Technology (ITB), seawater could cover as much as 26.9 percent of Jakarta by 2025. If this trend continues, 35.6 percent of ASEAN’s largest city will eventually be completely submerged. For those living and working in North, West and East Jakarta, as well as in some parts of Central and South Jakarta, the earth under their feet is literally sinking. In North Jakarta, the location of most of Indonesia’s economic activity, the land subsidence has passed 2.5 metres in 10 years. Some areas have sunk as much as four metres. Other parts are dipping at a rate of 25 centimetres a year, which is double the global average for coastal megacities. Under the weight of the ever-sprawling, ever-expanding urbanisation of Jakarta, the ground underneath is continuously compacting and sinking into the shallow aquifer. Without urgent remedial action, the sinking areas are exposed to increased flood risk, as well as damage to buildings and infrastructure. Already there are areas of descending ground, permanent wet soil and cracking buildings in North Jakarta. Research by the Faculty of Earth Sciences and Technology at the Bandung Institute of Technology shows estimates that by 2050, around 90 percent of North Jakarta will be below sea level. 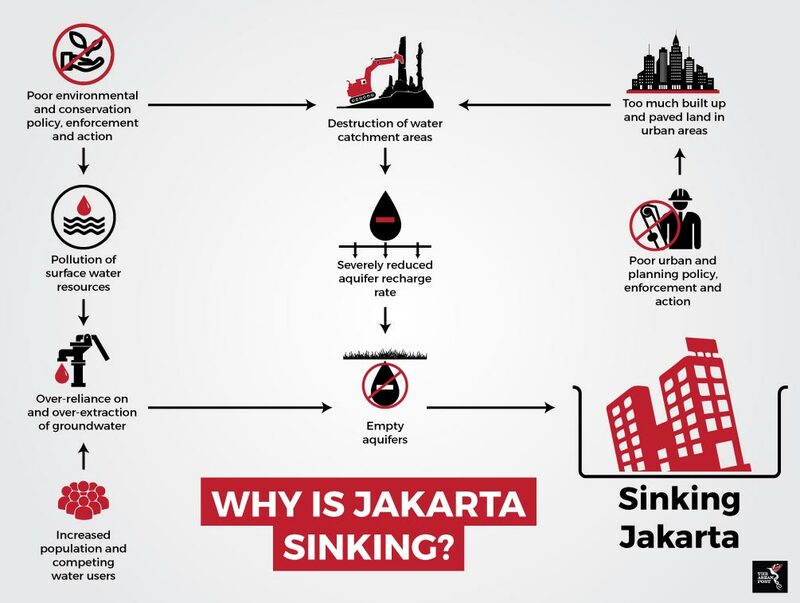 While coastal and delta cities are vulnerable to land subsidence by natural causes, the main culprit for the sinking of Jakarta is man-made. Decades of living dangerously in terms of water resource management, urban planning, waste and wastewater management, is taking its toll on the megacity. This is made possible by poor city planning, environmental and conservation policies, enforcement and practices. In severe cases of sinking land, the main cause is over-extraction of groundwater resources for everyday use. In the case of Jakarta, its surface water resources can’t be treated for consumption as they are too contaminated. Lack of proper and sufficient wastewater treatment, as well as waste management means that much of the megacity’s liquid and solid wastes are dumped into the 13 rivers running through it. Jakarta’s sole wastewater treatment plant, located in the Setiabudi Reservoir in Central Jakarta, can only treat about two percent of its wastewater. Jakarta’s Citarum river is considered one of the dirtiest in the world. According to the Jakarta Water Resources Council, the rivers in Jakarta supply only 2.2 percent of the megacity’s total clean water demand. The rest is piped in from outside Jakarta, namely from the Cisadane river in Tangerang and the Jatiluhur Reservoir. However, only 35 percent of Jakarta’s annual water needs of up to 1.3 billion litres is served by the water utility company. The rest is mostly served by privately drilled wells to tap the aquifer. In 2016, there were as many as 4,720 wells in Jakarta, up 5.5 percent from the previous year. Under normal conditions, the aquifer will be naturally recharged. However, the rate of groundwater recharge in Jakarta is too slow when compared to the rate of groundwater extraction. This is most probably due to the paving, development of built up areas, as well as deforestation. The Jakarta Tax and Levy Agency on Wednesday announced efforts to increase collection of groundwater tax from business entities. The agency hopes that improved data registration and inspection methods will increase their groundwater tax collected, which was US$9.8 million last year. The issue of sinking coastal megacities in Southeast Asia is not the domain of Jakarta alone. Ho Chi Minh City and Bangkok are also facing a similar situation, albeit at a slower rate. Before lives are lost, and before climate change impacts amplify the situation, the trifactor of water resource management, wastewater treatment and urban planning has to be addressed, not only through policy, but also enforcement, practice and education. For Jakartans though, the situation looks bleak as their city continues to sink. This article was first published by The ASEAN Post on 20 August 2018 and has been updated to reflect the latest data.